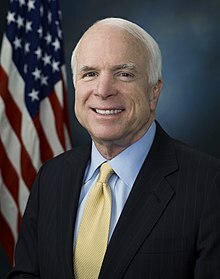 John Sidney McCain III (ojoibi August 29, 1936 - August 25, 2018) je oloselu ara orile-ede Amerika o je Alagba ni Kongresi lati Ipinle Arizona. ↑ McCain was christened and raised Episcopalian. See Nichols, Hans. "McCain Keeps His Faith to Himself, at Church and in Campaign", Bloomberg (April 25, 2008). He now identifies as a Baptist, although he has not been baptized as an adult, and is not an official member of the church he attends. See Warner, Greg. "McCain’s faith: Pastor describes senator as devout, but low-key", Associated Baptist Press (April 8, 2008). Retrieved September 6, 2008. Also see Hornick, Ed. "McCain and Obama cite moral failures", CNN, (August 16, 2008): "McCain, who was raised an Episcopalian and now identifies himself as Baptist, rarely discusses his faith." Retrieved August 16, 2008. Also see Reston, Maeve and Mehta, Seema. "Barack Obama and John McCain to Meet at Saddleback Church", Los Angeles Times, (August 16, 2008): "McCain [is] an Episcopalian who attends a Baptist church in Phoenix..." Retrieved August 16, 2008. ↑ Harris, Marlys. "Millionaires-in-Chief", Money (December 10, 2007). Retrieved July 16, 2008. This includes assets held in his wife's name. Only approximately $50,000 in assets are held in John McCain's name. Àtunṣe ojúewé yi gbẹ̀yìn wáyé ni ọjọ́ 26 Oṣù Kẹjọ 2018, ni ago 05:52.